Perma Marble Tile Adhesive (MTA) is especially developed for fixing marbles labs and tiles. Marble is generally loose grained and has a porous structure. Ordinary adhesives and grey cements have a tendency to leach into the marble surface with time and stain the surface. Because of this reason even the best selected marble shows the signs of becoming dull and grey and yellow very soon. Perma Marble Tile Adhesive not only helps in scientific fixing of the marbles, but also helps in maintaining the same luster of marble for years and years. Perma Marble Tile Adhesive makes the tiled area water proof. 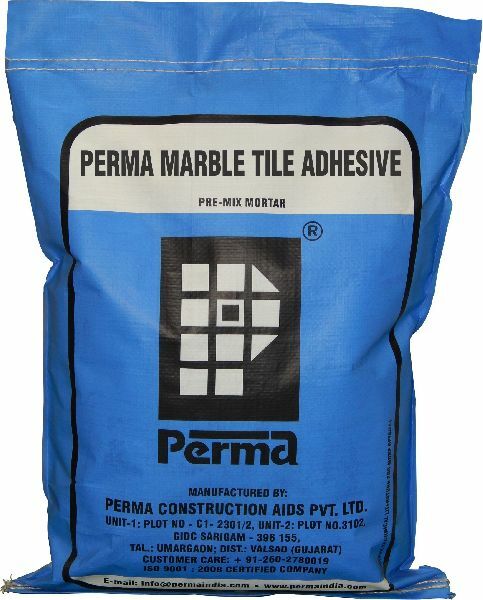 Packing : Perma Marble Tile Adhesive is available in 10 Kg and 25 Kg multi-wall laminated sacks.